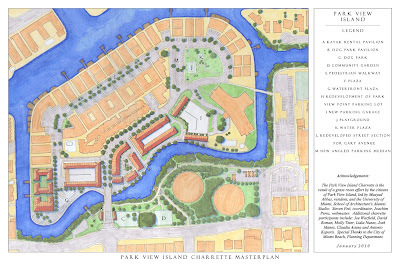 Park View Island Charrette: Park View Island Master Plan unveiled!! 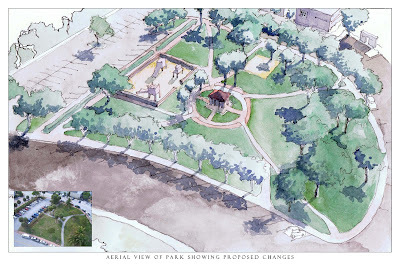 I liked the parking idea for the park, and the fenced in area for the childrens play area. Also the idea of extending Raymond street further east into the revamped town home development looks. 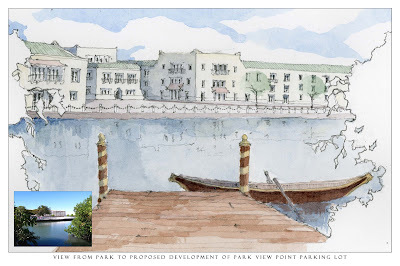 However further devlopment of the large Park View Point parking lot into townhomes who add too much further density without parking, so that would be something more difficult to support. Great idea for the entrance gaurd gates and the walkway accross from the idland. If the new townhomes couldbe developed by solving the PP building's parking it would be a great future idea.